There is really only one successful way to season a plow disk cooking utensil, and that is to use it, use it, use it!! When I cook with my personal discada I use a generous coating of Extra Virgin Olive Oil. Always preheat your disk and then add your groceries…… We have provided the initial seasoning for your disk so you can use it right away. 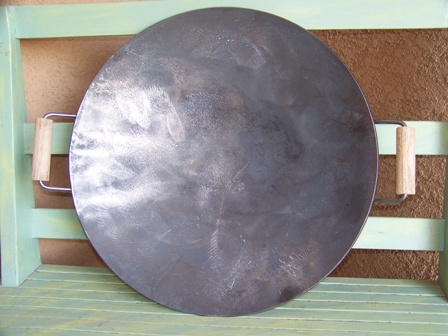 It only gets better after time and eventually you will have a very nice black seasoned disk. Be gentle with it until you build up a nice seasoned coating. Just follow a few rules when using your disk and it will provide you with a lifetime of use! NEVER cook at higher heat than is necessary to do the job. The secret to disk cooking is temperature control and the good news is that it’s easy to learn. Always try to remember to clean the discada while it's still hot. If it cools before you get around to cleaning it, it can be reheated. Sometimes a quick shot of a pan coating like PAM and 30 seconds on the burner will work wonders. Other times, just blistering hot water from the sink faucet will suffice. NEVER do any more cleaning than is necessary. A quick wipe with a towel is probably going to be all that's necessary. If a quick wipe with a paper towel won't do the job, pour some water in the disk while it is still hot and scrub it briskly with a stiff fiber brush; stiff enough to loosen any bits and pieces off and carbonized food sticking to the pan. Remember, what you want that coating to be is carbonized oil, not carbonized groceries. When you're done put a coating of oil in it and wipe it around with a paper towel. Yes, the paper towel will be black. No, it isn't dirt. The black is carbon. Don't forget to hit the backside with oil as well every now and then. Avoid wire brushes like the plague and never, never use those plastic scouring pads. Eventually, after enough use and proper cleaning, that surface in your disc will get to be just like Teflon or Silverstone type surfaces. It will require very, very little oil for most cooking. Until the disk is very well seasoned, either by many uses or repeated seasonings, do not attempt to cook foods with a high acid content. The corrosive nature of high-acid foods will not react well to the unseasoned disk. Once a disk is well-seasoned, however, you can use it for just about anything. Storing – store your disk in a dry place….check out our awesome covers made by fellow Veteran Eric with Mountain Ridge Gear! Bare cast-iron vessels have been used by humans for cooking for hundreds of years and your DIscada is no different in treatment (Our discs are carbon steel). The following includes examples using cast iron (ex. Dutch Ovens) and applies to the Discada as well. The Discada's ability to withstand and maintain very high temperatures makes it a natural cookware choice for searing or frying, and its excellent heat diffusion and retention makes it a natural choice for long-cooking stews like gumbo or Chili con carne. Because your Discada can develop an extremely "non-stick" surface, they are also a good choice for egg dishes, in particular scrambled eggs. Some of the types of cookware made out of bare cast iron include dutch ovens, frying pans, deep fryers, woks, potjies, and griddles. Bare cast iron cookware requires seasoning just like your DIscada—impregnation of the cooking surface with oil—to prevent rusting, and to create a non-stick surface. New cast iron must be seasoned before use. 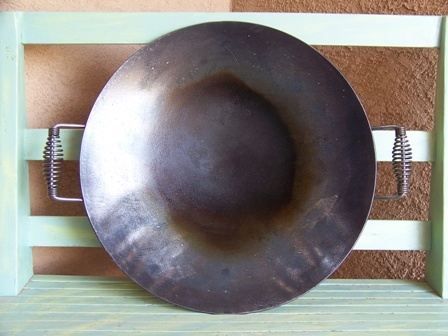 Some companies now offer pre-seasoned pans, but, like "home-seasoned" cast iron, these may need to be re-seasoned if they are washed with strong soap or allowed to rust. Seasoning is a process by which a layer of animal fat or vegetable oil is applied and cooked onto cast iron or carbon steel cookware. The seasoning layer protects the cookware from rusting, provides a non-stick surface for cooking, and prevents food from interacting with the iron of the pan. Almost all cast iron cookware is seasoned. Well-seasoned cookware will have a very smooth black surface. Fats and oils typically used for seasoning include lard, cooking oils / Olive oils / Peanut oils, and palm or coconut oil. Seasoning techniques - Once cleaned, cookware can then be seasoned. There are several techniques for seasoning cast iron - these vary based on the smoke point of the oil or fat used. Technique 1 - Simply wipe the cleaned cast iron with a good oil or fat and use it for frying and roasting, particularly high fat foods, like bacon. The oil or fat will impregnate the cast iron and gradually convert into a seasoning over time. Rendering animal fat in a new pan will have the same effect. Technique 2 - First, heat the cookware until water quickly boils when splashed onto its surface. Next, using a rag, wipe a thin coat of lard or oil onto the surface of the cookware. Lower the heat and continue to apply oil on the surface until the seasoning coating develops. Turn off heat and let it cool down. At this point, the cookware should have a black sheen and be ready for cooking. A new cast iron pan and your Discada will not be 100% seasoned after a single treatment. It takes repeated use for the pan to develop a seasoned, non-stick surface. If too much oil or shortening is applied to a pan in the seasoning process, it will pool and gum up when the pan is heated. 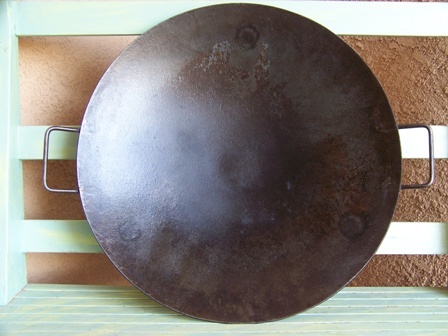 In this case, the goo can be scraped off and some more grease rubbed over the spot, or the pan can be re-scrubbed and reseasoned. Heating the pan upside-down may help prevent gumming, but will be more likely to drip grease unless protected by a foil-lined baking sheet. Seasoning at higher temperatures approaching the smoking point of the oil used will result in darker seasoned coatings in less time that aren't sticky or gummy. Care and cleaning after seasoning - Frying in the DIscada will help maintain the seasoning, as will roasting fatty meats or other greasy foods. Prolonged contact with wet or acidic foods, such as tomatoes, can dissolve or damage the finish. It is a common misconception that one should never use dish soap to clean seasoned cast iron cookware, since this will immediately remove the oil, and 'unseason' the pan (or even, according to some cooks, leave soap residue that will poison the food). In fact, a very well-seasoned pan can tolerate dilute dish soap, and, for infrequently used items, this may be preferable to leaving rancid grease on the cooking surface. In general, however, regular washing with soap is not recommended. Scrub the inside of a warmed pan with a tablespoon of a coarse salt, such as kosher salt, add a small amount of olive oil, and rub with a small piece of an old cotton cloth. Rinse with cold water. Scrub the pan with boiling or near-boiling water and a stiff nylon or fiber brush. Use veggie wash (milder than soap) and a stiff nylon or fiber brush. Boil a solution of cornstarch or rice starch and water in the pan, tilting the pan to make sure the boiling liquid touches all the way up the sides. Then pour out the resulting grease-water-starch solution, and peel off whatever dries onto the sides of the pan. Rinse the pan in hot water. In all cases, the cookware should be dried thoroughly after washing, and oiled lightly if not already very well seasoned.